GAINESVILLE, Fla. – Friday through Sunday, August 17-19. Mark your calendars, Gators fans. 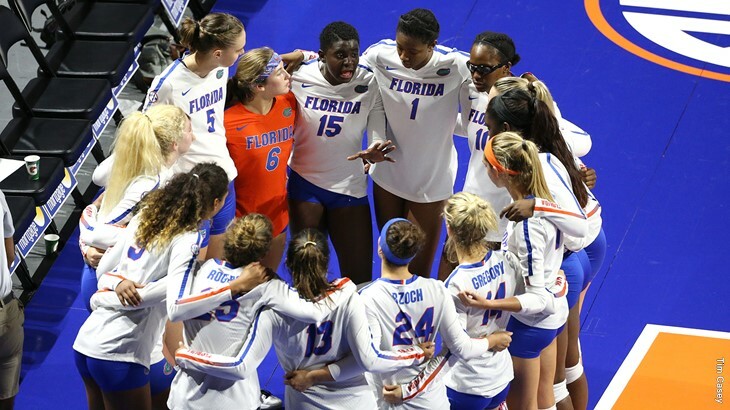 Florida’s volleyball team hosts its annual fan day on Saturday, Aug. 18, beginning at 2 p.m. in Exactech Arena at the Stephen C. O’Connell Center. Doors open at 1 p.m. and autographs with the 2018 team follow the Orange & Blue Debut scrimmage. On Sunday, Aug. 19, UF’s football team is hosting its annual fan day in the Indoor Practice Facility from 2-4 p.m. In addition to traditional autographs, there will be a kids corner, autographs of the Gators Spirit Squads & Gatorettes, and the chance to take photos with the Gators new Jordan brand uniforms. Fans also get the opportunity to check out the Gators Indoor Practice Facility. Admission is free to all of next weekend’s events. And if you are looking to collect autographed posters for all three teams this weekend, Gator soccer is signing their 2018 poster for fans following Friday’s season opener. Head Coach Dan Mullen and players will be available to sign autographs on the official 2018 Florida football schedule posters, which can be picked up Saturday’s event. WRUF – Country 103.7 The Gator will be on site to provide music. Fans interested in seats in the Evans Champions Club or Holloway Touchdown Terrace have an opportunity to tour the areas and speak with Gator Ticket Office representatives on site. The premium areas and representatives will be available from 12-2 p.m. The 2018 home schedule features home games against LSU, Kentucky, Missouri and South Carolina. The quickest and most efficient way to order is online by visiting “My Account” under the Gator Ticket Office tab on FloridaGators.com. Fans may also call the Gator Ticket Office at (352) 375-4683 or visit the Ticket Office on the west side of Ben Hill Griffin Stadium, Monday-Friday, 8:30 a.m. to 5:00 p.m.
· Due to NCAA compliance issues, no items other than the UAA provided posters at the event may be autographed. Fans may not bring outside items into the IPF for autographs. · Posters will be available at each station for autographs. o Each fan is limited to two (2) autographs per student-athlete to help keep lines moving forward and allow everyone a chance to get autographs. Violation of this rule will cause fans to be removed from the line. o Fans are not allowed to leave lines and go behind tables to take photos with any student-athletes. If you plan to take pictures, please stay in lines and have the photo taken from the line. Violation of this rule will cause fans to be removed from the line. o Fans are prohibited from asking student-athletes to sign autographs after the student-athletes leave the signing table to exit the facility. · Due to time constraints, we will have to cut lines off as we near the end of the event. o We thank you in advance for your understanding. · The following guidelines are applicable to items (e.g. posters) that contain the signature of either a student-athlete or a coach at the University of Florida. o The autographed item shall not be provided to a high school athlete or to the parents of a high school athlete. o The autographed item shall not be provided to a high school booster or to a high school booster organization. o The autographed item shall not be sold without the written consent of the University Athletic Association, Inc.
o The University Athletic Association, Inc. reserves the right to request the return of any autographed item. · Should you have questions or comments about these guidelines, please contact the University Athletic Association by calling 1-800-34-GATOR. The 2018 team will be available to sign autographs on the court after the scrimmage. Kids in attendance can enjoy tailgate games and poster making in the Gate 1 lobby prior to the scrimmage. The 2018 campaign features 15 matches inside Exactech Arena at the Stephen C. O’Connell center, including the season opener against No. 10 Southern California on Aug. 31 at 7 p.m.
Florida plays hosts to two tournaments this season – The Bubly Invitational (Aug. 31-Sept. 2) and The Honda of Gainesville Gator Invitational (Sept. 14-15). Who's excited for Fan Day?! August 18 @ 2pm is your chance to meet the 2018 team! · Join the Gators for their 2018 home opener. The first 250 fans in attendance will receive a free t-shirt. In addition, the new team poster, schedule cards and magnets will also be available on the concourse. Following the game members from the team will be signing autographs on the concourse level of Dizney Stadium. · It’s Faith & Family Night at The Diz as members from all local churches are invited to cheer on the Gators. · Fireworks, autographs and more! The Gators host their first ranked opponent of the season for Mystery Night at the Diz. Students will be entered to win a mystery prize just for attending and following the game there will be a fireworks show. Members from the team will be signing autographs on the concourse level following the game as well.